For many people in the community, Drug Court is something they have heard of but are not necessarily familiar with. Participants of drug court are sentenced by a judge, and the program takes 18 months to complete. The program is designed to help people with a history of drug abuse. There are four phases, the first and fourth phases are three months, the second and third phases are six months. The participants are required to meet certain milestones before they can advance to the next phase. During drug court, the participants are required to attend substance abuse counseling, extensive treatment and self help meetings. They are also required to complete community service hours and report back to their probation and parole officer. There are random urinalysis tests to ensure the participants are staying on track, and they attend court twice a month. Andy Brant, probation parole director, added, “It’s a very intense program.” Once a participate has completed all four of the phases, they graduate. After graduation their charges are dismissed by the court. Recently, Drug Court has re-structured the program and many changes have taken effect. Chris Winters is the substance abuse counselor, Shawn Billings is the drug court coordinator and Andy Brandt is the probation parole director. Others involved with drug court include: prosecuting attorney Amy Boxx, assistant prosecutor Christina Hammers, Cassville Police Chief Dana Kammerlohr, circuit clerk Craig Williams, deputy clerk Shannon Pyle, tracker Mike Ardock, attorney Mike Riehn, Clark Center substance abuse counselor Heather Hays. Judge Johnnie Cox will be taking over Victor Head’s position as the drug court judge this summer. 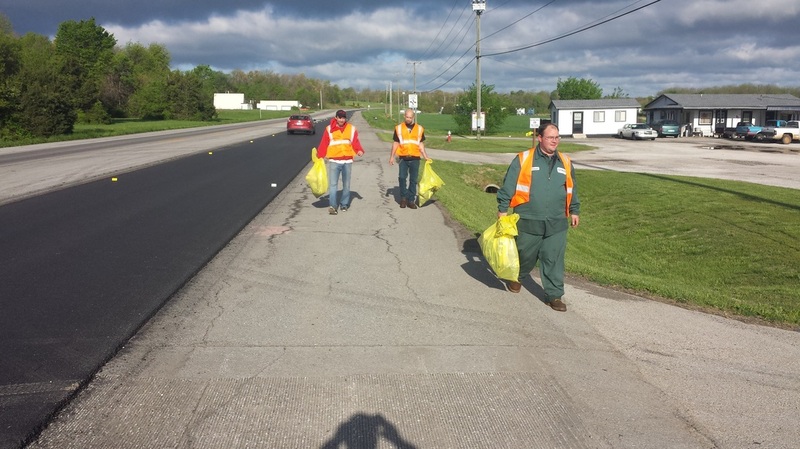 Drug court recently conducted a litter clean up on Highway 60 in conjunction with National Crime’s Victims’ Rights Week, which took place April 19 through 25. “The Barry County Drug Court participants volunteered to help Monett Masonic Lodge #129 with their Adopt-a-Highway in Monett, “said Andy Brandt, probation and parole director. Eight participants worked and were served coffee and donuts. “The members of the Lodge were impressed with how hard the volunteers worked and will be teaming up the Barry County Drug Court in the future for additional highway cleanups and other community service,” said Brandt. The Drug Court participants included: Krissa Strong, Chris Whittington, Jody Douglas, Richard Harper, Justin Schmidt, John Gamroth, Matt Henson and Rick Swearingen. 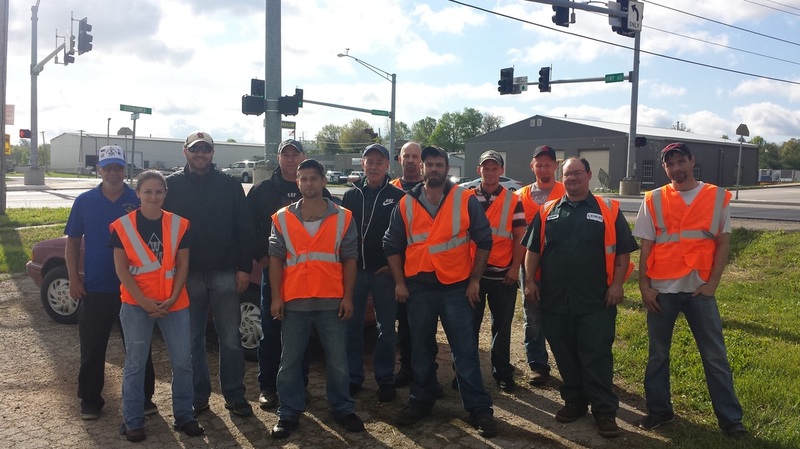 Drug Court participants and Monett Masonic Lodge members are pictured above on the highway clean up day. In the front row, from left to right: Barry County Drug Court participants: Krissa Strong, Chris Whittington, Jody Douglas, Richard Harper. and Justin Schmidt. Back row: Monett Masonic Lodge member Vern Miller, Monett Masonic Lodge member and Probation and Parole Officer Andy Brandt, Monett Lodge member Mike Shanks, Monett Lodge member Skip Smith, Drug Court participant John Gamroth, Drug Court participant Matt Henson, and Drug Court participant Rick Swearingen. Above, Drug Court participants Justin Schmidt, John Gamroth, and Richard Harper (from left to right) haul bags of trash from the highway clean up on Saturday.